Q. Does Face-weight have any bearing on carpet quality? Face-weight does have bearing on the quality of carpet but not with every type of carpet. Let me explain. Face-weight is the amount of fiber or yarn that is used to make the carpet pile. I am sure that you have seen thin carpets and thick carpets, the thicker the nap (pile) the higher the face-weight. Just because a carpet is thicker doesn't mean it will last longer or wear better. The key to longevity and durability is in the type of fiber you select. Learn about What Grade of Carpet Should I Select? About Carpet Made from P.E.T. Q. What are your opinions on this new fiber? I have a very active home (4 inside dogs, 2 kids, traffic, traffic, traffic) and I am considering purchasing this carpet for my living room and hallway. What do you think? While polyester is a very soft synthetic fiber, and it is available in wonderful colors, polyester fibers will mat down quickly and is very hard to clean. It sounds to me like you really need a carpet that cleans easy. The main problem is that polyester or PET will crush or mat down in a hurry. That means in areas where there is heavy traffic, like down the hallway, polyester/PET carpet will mat down quickly and never come back to its original appearance. In your case, with kids and pets I bet within six months you would be very unhappy with your polyester carpeting. Do not listen to the advice of carpet sales people who recommend polyester, no matter what they say! Because polyester is so cheap to make, carpet manufacturers have tried for years to make a good carpet out of polyester, with limited success. every year they come up with some new technique that they claim will make polyester more durable. It hasn't happened yet. Nylon carpet is more expensive than polyester, but it will tolerate an incredible amount of abuse. It cleans easily and won't mat down like polyester. Buy a continuous filament 100% Nylon carpet and you will be much happier in the long run! Nylon is the most durable carpet fiber and is known to tolerate heavy foot traffic and last years longer than any other fiber. It also resists stains and is easy to clean as most nylon fibers are treated with topically applied anti-stain treatments. The exception is with Stainmaster nylon 6.6 where they infus the fiber with Teflon to make the fiber more resistant to stains and the treatment is infused and will not wear off over time like the other topically applied anti-stain products. This is what makes Stainmaster Nylon 6.6 better than all other fibers. Sorona is another option if you want a carpet that is easy to clean and very stain resistant. It is also known as Smartstrand by Mohawk. It is a fairly new product but it seems to be very durable. The Sorona or Smartstrand Fiber is a better choice than Polyester or PET Polyester if you want your carpet to last longer and resist matting and crushing of the pile. See my Recommended Carpet Stores near you. Q. I have a question regarding carpet for my indoor stairs (steps). How should I go about completing this job myself? Installing carpet on stairs is very difficult and easy to make costly mistakes. Putting carpet on stairs will usually require hiring a professional to measure and install. You should contact a qualified carpet installer to help you with this. If you give me more details about what you would like to accomplish, I may be able to give you additional helpful information. Carpet manufacturers do not warranty any carpet installed on stairs. In my Complete Carpet Buying Guide ebook I provide detailed instructions about how to measure your home for carpet including a Stair and Landing Measuring Chart to help you determine about how much carpet you need to buy. Q. Should I Choose Berber Carpet? Q. Hi, I was wondering how well does Berber withstand high traffic areas. Is it easy to keep clean and what kind of padding is the best? I am going crazy trying to decide if I want a plush carpet or Berber. I have a newborn son and know I will soon have lots of messes to clean up! Thank you for responding at your earliest convenience. Berber can be made of Nylon or Olefin, and of the two, Nylon would be the better choice. Berber is a nice looking carpet, and can be quite reasonably priced. However, It is not the best choice for folks with kids or pets. If you must buy a Berber be sure to select one with small loops, the big loops fall over quickly and look bad sooner. As far as pad goes, an 8-pound 1/4" to 3/8" thick is recommended. Not The Carpet I Ordered? Q. I just purchased some nylon Berber carpet. However, the weave or loop is much larger than the sample and I have concerns about the nylon pulling. I like the smaller loop. The larger looks like the yarns has been snagged or pulled. I found you web site very helpful, but what happens when the carpet comes in and it does not appear to be the same weave, or loop that was selected? Q. I want to replace my family room carpet with a different color, but not the bedroom. What do you do where the two carpets meet? A carpet layer would seam the two carpets together right underneath the door between the two rooms. He cuts both sides straight and puts some hot melt seaming tape under the carpets to join them together. Even if the two carpet colors are very different it doesn't usually look bad, it is very common to have different colors of carpet throughout the house. Moisture Barrier Pad for My Dog? Q. I have an older dog that does have urine accidents and this is what I am faced with. I plan on putting down a moisture barrier pad, that I think will help w/the cleaning. What do you recommend for this situation? Q. I am shopping for new carpeting to be installed over a dry concrete floor. Every salesperson gives us a different recommendation for the padding. What is best? Rubber, Rebond or Fiber? Answer: If your basement is dry you have nothing to worry about. Rubber padding is expensive and is a great pad for basements but Rebond pad is great too and it is much less expensive. If you have any moisture in your basement at all, I would recommend using a Synthetic Fiber Pad. It breathes well and is mold and mildew resistant. It would be a smart idea to do a moisture test just to be sure. you can get a low-cost moisture test kit at a flooring distributor or ask your carpet dealer where to buy one near you. If I were buying carpet for my basement, I would definitely buy a Nylon carpet, and use a 6 or 8 lb. rebond pad. Expect to pay about $3.50- $5.50 per yard for a good quality pad. Q. We are considering these carpets a our family room. We would greatly appreciate your opinion. There are no children in our household, and this is a low-traffic area. Traffic-master (Wear-Dated Carpet II) style Pacesetter , rated about 3.7 for performance (at high end of active traffic wear), 100% Solutia Wear-Dated II Nylon, twist of 3.85, density of 3.772, and face weight of 72 ounces. With your nylon selections and low traffic application, either carpet would be a good choice. Personally I like the Master's Choice because it has a higher tuft twist of 7.5, which tends to make a carpet look like-new longer. You are considering two quality carpets. They both have the capability to last 10 to 20 years if cared for. You have done your homework well, good job! 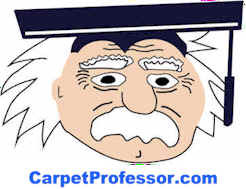 Take my free Carpet Foot Traffic Test to see what grade of carpet you might require. It's hard to find a reputable carpet dealer these days! That's why I have built my own special list of hand-picked carpet retailers who are locally owned, give free estimates, offer fair prices, have knowledgeable staff, provide honest measuring and hire qualified installers. See who I recommend near you!